Have you ever looked at diggers and cranes and imagined they look like dinosaurs? 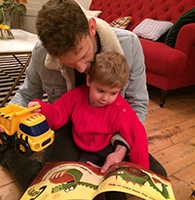 Well this book does just that, tapping into two popular themes with young children and blending them together to create an amazing set of creatures – DIGGERSAURS! Bold illustrations, a rhyming text and an imaginative idea make this a great story for sharing again and again. Have fun with reading this story aloud dramatically, including the sound effects. There is lots to look at in the illustrations and children may well want to talk about some of the diggersaurs. If you read this story often, children will remember the words and be able to join in as you read. 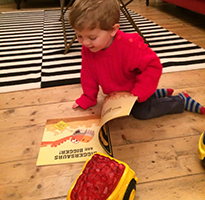 They will enjoy the sound effects and may like making them with their voices or improvised instruments. The end papers are fun for this too, you could take turns saying the sounds. Talk about the names for the different diggersaurs, lots of them have names that are about the job they do. Perhaps you could make up more together. 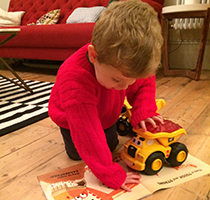 Which is your child’s favourite diggersaur? Spot the details in the illustrations and talk about them, for example what the little figures are doing, the dinosaur fossil, how the ‘breakasaurus’ creates cracks in the earth. See if you can spot any ‘diggersaurs’ (diggers and cranes) and talk about what they are doing. What might they be called? 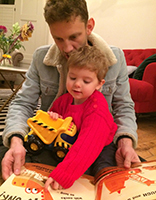 If you have toy diggers children could put stickers on them for eyes and make up names for them. If you have access to sand or earth they could play with their ‘diggersaurs’ there. Over three’s could draw a diggersaur, perhaps design a different one. What will its name be? 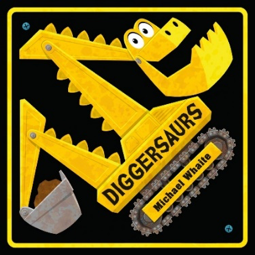 Older children might like to try Michael Whaite’s step by step instructions for drawing a diggersaur, see here.